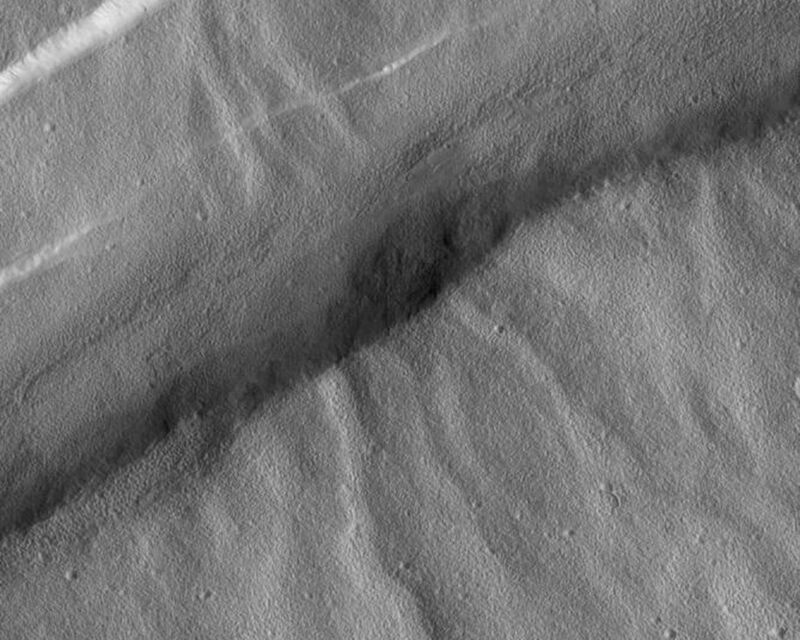 In 1972, Mariner 9 images revealed a variety of branched and networked valleys on Alba Patera, a volcano in northern Tharsis. Since then, the question has always been, "what made these valleys, water or lava?" 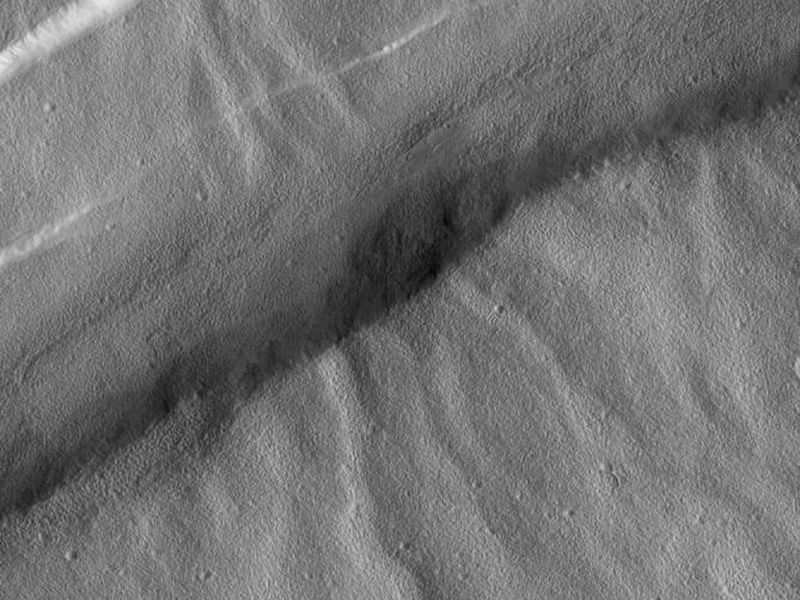 Because the Alba Patera volcano was considered to be a relatively young feature on Mars, it seemed that if waterways involved in the formation of the valleys, then it would imply that liquid water flowed on this part of Mars at a relatively recent time in the planet's history. Thus, it was hoped that Mars Global Surveyor (MGS), with its super-high resolution Mars Orbiter Camera (MOC), would help answer this key question about evidence for past water on the red planet. However, when MOC peered down upon these valleys it became clear that the camera might not help answer the question of their origin. 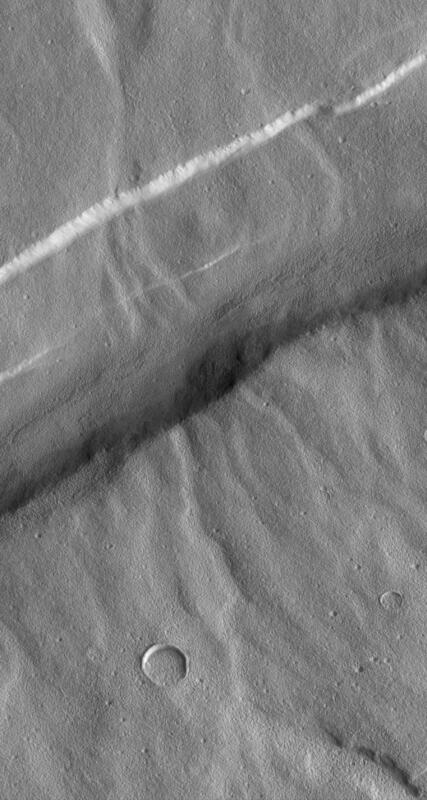 As the picture above shows, these valleys--which trend from lower right to upper left in the picture--are old and have been cut by younger faults that created graben--e.g., the wide, straight valley running diagonally from upper right to lower left. Worse, the close-up views revealed that the valleys are covered up by a lumpy-textured material that also partly fills nearby impact craters. The origin of the textured material is unknown but might result from years and years of wind erosion of surface "soil" or volcanic ash. 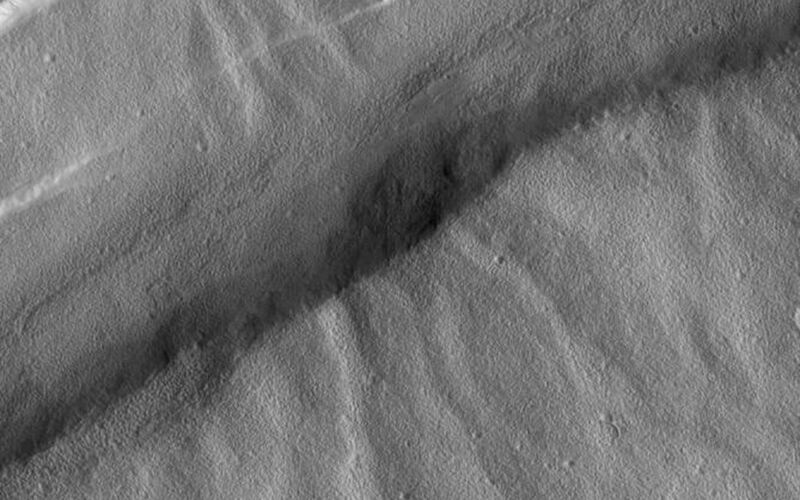 However it formed, this covering obscures so much of the details of the valleys that high resolution pictures are unlikely to solve this mystery. The picture above covers an area approximately 8 kilometers (5 miles) wide by 15 kilometers (9 miles) high. Illumination is from the right. The picture was acquired in August 1998 during the MGS Science Phasing Orbits imaging campaign, and was presented at the 30th Lunar and Planetary Science Conference in Houston, Texas, March 1999.